As an author of five books, I believe in the power of them and as a trend curator and University Professor I consume many of them. I buy several new non-fiction books a week and often invest my time and attention in reading them and learning from them. What I don’t do is read most of them cover to cover. Yet some of the most lasting ideas that I get from books come from reading them in bursts. I consume books and ideas the same way travelers consume frequent flier miles – as momentary rewards to be redeemed at a later date. Books can share powerful ideas that might change your life or career in an instant. To some degree, creative thinking has always been like that. It can take a lifetime to build up enough experiences and insights to be able to solve the ultimate creative challenge in an instant. That is why compensation models for creative professionals are so flawed … because they reward time spent instead of insights delivered. What if that same model of rewarding time instead of thought became a pervasive choice in our society? What if the politicians who received the most attention were the ones who were able to filibuster the longest? What if the scientists that recieved the most funding were the ones who wrote the longest papers? What if TED talks had to be 70 minutes instead of 17? It is hard to imagine such a world where we might start rewarding the people who waste the most time in sharing their ideas. As strange as this may seem, it is exactly the world Amazon could accidentally thrust the world into with a recent announcement they made to only pay authors of self published Kindle books enlisted in the Kindle Select program based on how many pages readers actually consume. On the surface, this seems like a pretty logical idea. After all, why should the author that writes 400 pages of complete crap that no one actually reads be rewarded simply because they were able to produce a great cover and have a few dozen positive fabricated reviews? Isn’t it better to only reward the best books? As several writers have also pointed out, much of the indignation about this announcement comes from a fundamental misunderstanding of what is actually changing. What Amazon has done is tried to transform it’s Kindle Select borrowing program (and how authors get paid from it) into a fairer and more equitable model of rewards based on actual content consumed. It makes a lot of sense within that model. Even outside of Kindle Select, a merit based system of rewarding authors isn’t necessarily a bad idea. As an author who does obsess over the words he uses and puts in years of effort to publish a book – I would personally LOVE a way to separate my books from the vanity published fluff that easily makes up the bulk of self published ebooks one can find in the Kindle store today. 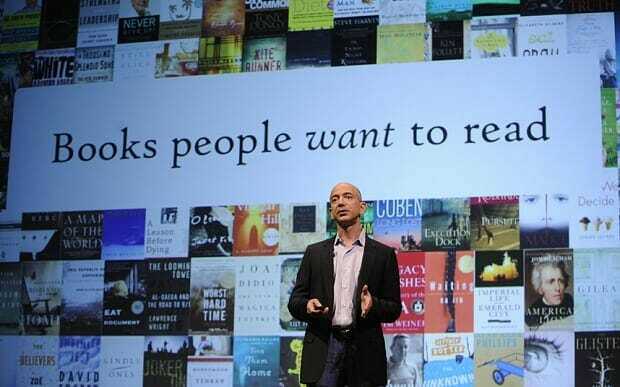 Unfortunately, Amazon’s nuanced choice for the Kindle Select program where readers are borrowing books and authors are getting paid from a central pool may cause other groups to start thinking differently about how creativity is compensated in general. What if Amazon’s move inspires others to begin devaluing creativity itself? Creative agencies might start being challenged by clients who only want to pay for ideas that are turned into campaigns. 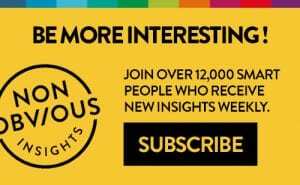 Researchers might only be paid for insights that could be monetized. The point is that paying only for time spent is usually a flawed idea because it fundamentally reduces the value of experience and insights. A great work of nonfiction can move your thinking from one place to another. It can dramatically change how you think about the world. There are dozens of books that have done that for me, despite the fact that I may not have entirely read every single page or every single chapter within them. As an author of several nonfiction business books, I can honestly say that I really don’t expect every reader to consume every one of my books from cover to cover. 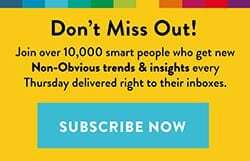 In fact, in several of them I have started off by advising readers to avoid doing just that – and instead to consume only the pieces that seem most relevant for them right now. I want to change how people think, and I want to be useful to help them get back to their lives and do something meaningful. If reading just one chapter of one of my books helped them do that, then the value of the book has been worth it. I would gladly pay $20 for a powerful idea in the form of a book that changes how I work … even if I didn’t read that same book cover to cover. Nearly 80 years ago, Australian farmers introduced the cane toad into their environment to kill the Grey Cane Beetle. Today there are 1.5 billion toads (and growing) spreading out across Australia. What seemed like an ideal solution to a problem rapidly escalated into a plague. Amazon’s shift may be the intellectual equivalent of the cane toads in Australia. The intention of creating a world where the most valuable ideas get rewarded and shared is a noble goal. The challenge is that the best ideas don’t always take the longest to share or require a cover to cover reading of a book in order to have impact. 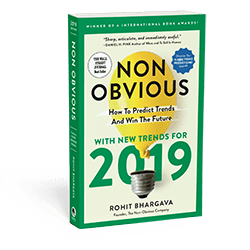 Rohit Bhargava is the Wall Street Journal best selling author of Non-Obvious and four other Amazon #1 marketing best sellers. He believes in the power of books, even if you don’t happen to read them from cover to cover.